A wealth of artefacts from the Viking era unearthed during BAM’s major development of the former Beamish & Crawford site in Cork city centre is set to go on display this week in partnership with Cork City Council, Cork Public Museum and University College Cork. The discoveries have yielded fascinating detail of the city’s origins, positioning Cork as one of the earliest Viking settlements in Ireland. As it was not possible to allow the public on site during excavation, BAM has funded the ‘Below our Feet’ exhibition at Cork Public Museum at Fitzgerald’s Park that will begin on Friday 25th May and run throughout the summer. A collection of spoons, ladles and buckets as well as a wooden thread-winder with the design of two horses’ heads carved into it. A team of archaeologists excavated the site between November 2016 and March 2018 on behalf of BAM. The excavation produced evidence of the earliest urban layout of Cork City discovered to date with the first houses on the site built around 1070 AD. The lowest excavated features were 4m (or 12ft) below the level of South Main Street today and excavated strata represented almost every period from the history and development of Cork. The exhibition aims to highlight some of the findings with emphasis on the earliest excavated levels dating from the 11th and 12th centuries and the Late Viking-Age or Hiberno-Norse era, a period when the cultural sphere experienced a mixture of Scandinavian and Native Irish influence. Also on display will be the wooden structures and items recovered from the excavations that reveal 12th century Cork as a wooden town where all the houses and many of the objects in everyday use were made from wood. 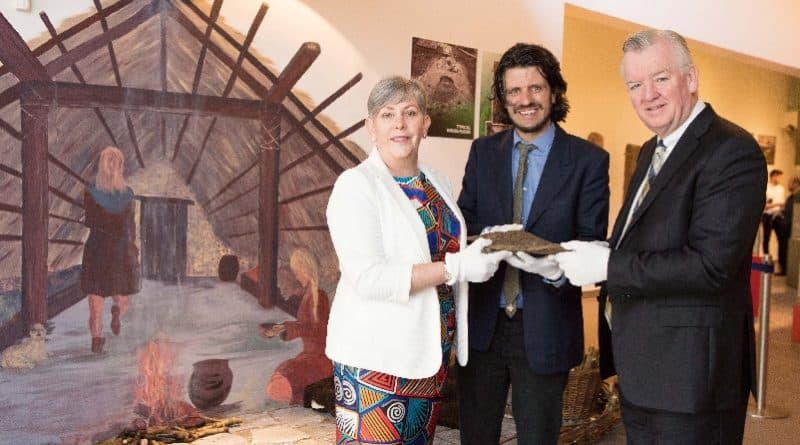 The exhibition, which shines a light on the Vikings’ housing, clothing, cooking methods and religious practices was prepared by Dr Maurice Hurley and his staff in conjunction with the students of the MA course in museum studies at University College Cork. Cork Public Museum is within walking distance of Cork city and holds exhibits that trace over 7,000 years of human settlement in Cork. The museum showcases the city’s rich civic, political, military, social and cultural history. BAM Ireland has helped to shape the infrastructure of Ireland for the past 60 years through its principal activities of building contracting and civil engineering in the public, private and PPP sectors. Other activities include facilities management, property development and rail infrastructure. It currently employs over 2,000 people directly and indirectly.